Inatur Whitening BB Cream is an ultimate skin perfecting cream that brightens your dull complexion and fades dark spots and blemishes. It is a one stop solution for all your whitening needs as it lightens and brightens your skin from within. It acts as a daily skin protector that lightens skin, even out skin tone, protects your skin from Sun's UVA/UVB rays, conceals fine lines and brings radiance to your face. It is extremely lightweight and is easily absorbed by the skin. Additional Information:Inatur is a renowned beauty brand that focuses on world-class skin care products made of 100% natural ingredients. Constant innovation and quality drives this company towards success. Inatur Whitening BB Cream gets you one step closer to an ever glowing beautiful skin! Explore the entire range of BB & CC Cream available on Nykaa. 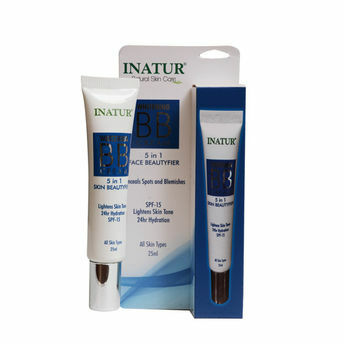 Shop more Inatur products here.You can browse through the complete world of Inatur BB & CC Cream .